Not a radical departure from version 1, but still one of the most versatile dynamics-shaping plugins money can buy. 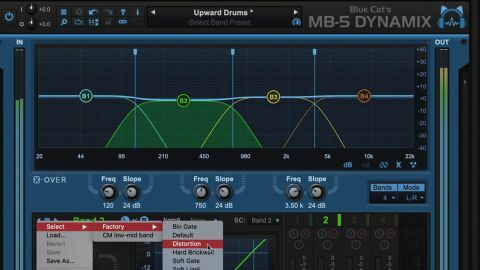 To most intents and purposes, a multiband version of the broadband Dynamics plugin, Blue Cat Audio’s MB-5 Dynamix (VST/AU/AAX) is a multiband dynamics processor geared up for compression, limiting, gating, expansion and waveshaping. We looked at the original MB-5 way back in 2011, and version 2 introduces not only a full overhaul of the GUI, but also a redesign of the underlying algorithms for “improved performance and precision”. Since it’s been so long since last we looked at the plugin, we’ll come at it from fresh here, rather than just talking about the new stuff. With its cleaner appearance and tweaked layout, MB-5 Dynamix 2’s reworked GUI is easier on the eye and a little more logical to navigate than that of its predecessor. Most importantly, though, the window can now be resized from 70-200% - about time, too, as v1 is pretty fiddly on a high-res display. The new top bar brings together various ancillary functions including I/O gains, Undo/Redo and zoom level, and is home to a well stocked library of presets. The number of processing bands, from one to five, is selected using the menu in the X-Over section. All parameters are maintained when deactivating bands, so you can flip from, say, three bands to one, then back again, without losing the settings of bands 2 and 3. Complete states can be copied between bands and saved as section presets. The band crossovers are adjusted by dragging handles in the display at the top or sweeping the Freq knobs, and the slope of each filter is set discretely from 6-60dB/octave. The bottom left panel shows the controls for the currently selected band, and it’s here that we find one of MB-5 v2’s most powerful features: the architecturally unified but independently operated Up and Down processors. These enable simultaneous downward compression or expansion (Up) and upward compression or gating (Down), making it possible to compress the peaks in a particular frequency range and separately manipulate everything below the threshold at the same time. Both are identical in terms of controls, apart from the ‘bipolar’ Ratios, which range from 1:2 to inf:1 for Up, and inf:1 to 1:30 for Down. The Knees goes all the way up to a super soft 30dB, and the new Depth parameter sets a limit to the amount of gain reduction (or increase) that’s allowed to be applied - a ‘range’ control by any other name. Although MB-5 Dynamix 2 doesn’t have the VCA/Opto response morphing or envelope Shape controls of Dynamics 4, it does retain the continuous transitioning between peak and RMS detection, and the Hold envelope stage for peak detection in between Attack and Release. The RMS window, meanwhile, is configurable to anywhere between 1ms and 5s. External sidechaining is onboard, of course, for triggering the detection circuits of individual bands with signals from elsewhere in the host DAW, but using the powerful internal sidechain routing system, any band within the plugin can be set to control the response of any other band(s). And in combination with the stereo linking options, one channel within a band (L/R or M/S) can even be selected as the sidechain source for the other, opening up all kinds of creative possibilities. You could, for example, pump up the reverb in the sides channel of a stereo drum mix using the (bypassed) centre as the triggering source. In conjunction with the consistent band colour-coding used throughout the plugin, MB-5 Dynamix 2’s two displays provide a wealth of visual information as to what’s happening with your dynamics processing. The lower display shows the dynamics curve for the currently selected band and those linked to it, or all of them at once, with a fill-in reflecting the envelope response. The top display plots frequency on the X axis and volume level on Y, and is rather busier and more interactive, permitting adjustment of crossover frequencies by dragging the blue handles horizontally, and the make-up gain for each band via the vertically mobile (and concealable if they’re getting in the way) B1-B5 handles. On top of those, you can opt to overlay the global response curve for a real-time view of level movement across the whole frequency range, and/or one of three spectral visualisers, showing both channels (L/R or M/S) together or either on its own. Spectrum is a regular ‘momentary’ response curve, while the Grey and Color Spectrograms show the frequency response over time. It’s all very useful stuff, and if you like, you can in fact collapse the whole interface down to just the top display - or, indeed, everything but. The Monitoring section houses per-band level and gain reduction meters, dual threshold sliders, and Bypass, Mute and Solo buttons. Any or all bands can be linked for grouped threshold adjustment, and hitting the Reverse button on a linked band sets its threshold moving in the opposite direction to the others. Finally, a brickwall limiter at the output offers variable knee and up to 1000ms of Release; and the Mix knob balances the dry input and wet output signals for parallel processing. Just like its single-band sibling, MB-5 Dynamix 2 is a plugin that focuses on flexibility and precision, rather than character, and one that requires solid understanding and experience of dynamics engineering to get effective results out of, not to mention a very steady hand. The multiband functionality is beautifully implemented and easy to work with, and the ability to apply both gating and compression by shaping a single composite response curve is empowering - although, as we mentioned in our review of version 1, the fact that they share the same envelope and RMS window takes time to get used to. Similarly, the internal sidechaining scheme is quite mind-boggling in its scope for having one element within a signal control the shape of another; and the extreme waveshaping effects that can be conjured up by zeroing the envelope times add a further creative angle, especially when it comes to toughening drums and percussion. Once you’re up to speed with it, there’s no level-shaping task that Blue Cat’s amazing plugin can’t deftly turn its whiskers to. The upgrade from version 1 is free if you bought it within the last two years, or a very reasonable $29 if not, and we have no hesitation in recommending MB-5 v2 to existing users and technically experienced newcomers alike.